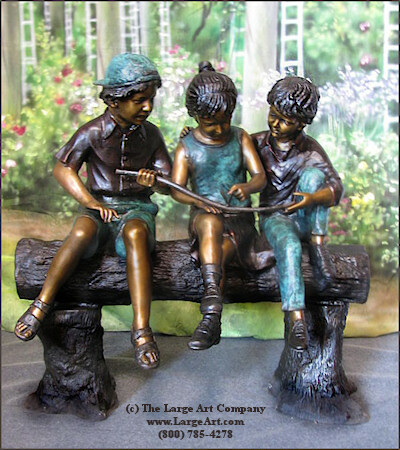 An adorable bronze sculpture of children sitting on a log. Available in multiple color schemes as shown in the pictures. The standard colors are a combination of brown, Verdi Green, dark hunter green, and burgundy. Each piece is slightly different. You can also have it in solid statuary brown or Verdi green. Or maybe just the clothes all green. Please specify when ordering. We have these cast ourselves using high quality American bronze. This sculpture would look great in a garden or park or at a school, library or other public venue. It is intended for outdoor display and will last for hundreds of years with little maintenance. For more information about care and cleaning click here. Measurements: 49" high by 71" long and 24" wide. This is not one of the mass-produced and low-quality import children statues you may have seen before. Similar sculptures are made all over the world because the copyrights have expired and the molds are readily available on the commercial market. However, that is where the similarities end. For more information about what makes our bronze sculptures and bronze statues different, please see our Frequently Asked Questions.